Determined to expose the town's hidden skeletons, Ky unwittingly thrusts herself into a much bigger plot. They thought she’d forgive and forget. They’re about to learn they messed with the wrong girl. DARE YOU TO LIE follows Kylene Danners after her father is framed for murder. After being found guilty Ky must return to the town that she ran from after a photo scandal. Ky’s only care is clearing her fathers' name but no one will let her forget her past and Ky will have to decide how far she’s willing to go to uncover the truth, get her father out of prison, and keep her and her friends safe. Dare You to Lie was the perfect blend of creepy and intriguing and there is nothing I like more than an intense page-turner. Ky from the very beginning was a great character who at times could be unlikable. She couldn’t let things go and she always had to have the last word but those moments made her feel more real to me. She was a character that stuck to her guns even if someone didn’t agree and I admired how dedicated she was to clearing her fathers' name. Other than the characters what really pulled me into this and had me turning the pages as fast as I could was the conspiracy behind both Ky and her fathers' cases. Two seemingly random cases that begin to relate to each other more and more. And every time you got more of the puzzle you just ended up more confused than ever. I love being able to guess who the bad guys are but even I was stumped. Natusch not only writes great characters but writes an amazing plot that keeps you guessing far past the ending. One thing I will mention is that this book does have mentions of sexual assault and abuse. It’s nothing graphic and they don’t go into detail but it does come up throughout this book. Overall I went into this book only knowing it was related to Veronica Mars and I left with a whole mess of questions and a need for the next book. Natusch has caught my attention and kept it. 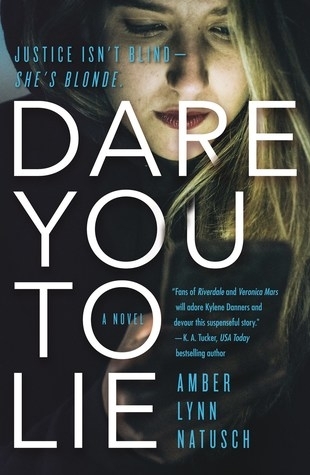 With a plot that won’t quit and characters you can’t help but like Dare You to Lie is a must read. It’s clever, funny, edge of your seat thrilling and I read the entire book in a day. If mysteries and town conspiracies are your thing then I highly recommend picking up Dare You to Lie. *Find More Info On This Book HERE! !